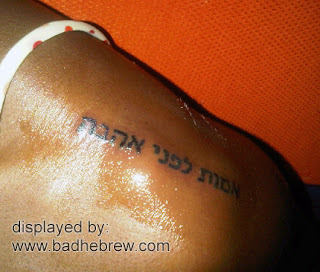 Today's victim was going for a poetic message: "Loyalty before love" tattooed in Hebrew. But something went wrong with the translation of the word loyalty; It didn't come out quite right... and so the message turned into a completely readable "I'll die before love". Interesting - this particular mistake can also be translated as "I will die in front of love". Can we give the benefit of doubt- it's "Cubics (Biblical, Rabbinic) before love"